The term flamb [flahm-BAY] is a French word meaning “flaming” or “flamed.” Flambe means to ignite foods that have liquor or liqueur added. This is done for a dramatic effect and to develop a rich flavor of the liqueur to the foods without adding the alcohol. Impress your family and friends by serving a flambe dish. Lots of fantastic recipes using this Flambe technique. 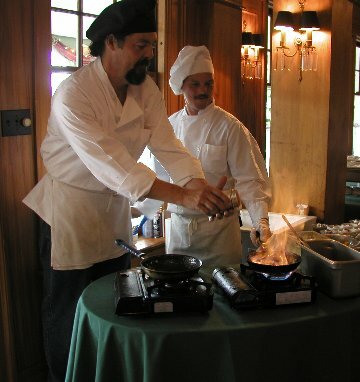 Executive Chef Dave Lynch and Kelly Schweitzer of The Rutherglen Mansion in Longview, Washington demonstrate how to flambe. Please remember to use extreme caution here, you will be dealing with a liquid that is on fire. Do not carry the dish while flaming, this is best done on a serving cart slightly away from your table. Keep a large metal lid on hand, to cover the dish in case your flambe gets out of hand. 1. Have all your equipment and ingredients needed to flambe your dish ready before starting the process. 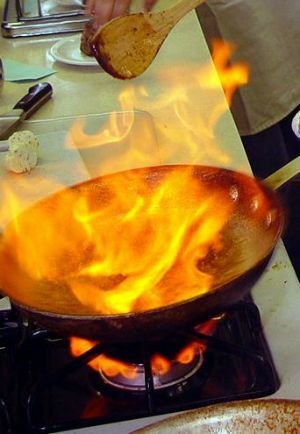 Use an 80-proof liquor/liqueur or 40% alcohol by volume for flambng. Choose liquors or liqueurs that are complimentary to the food being cooked, such as fruit flavored brandies for fruits and desserts and whiskey or cognac for meats. Beer, Champagne, and most wines can not be used when flambng. Liquors above 120-proof are highly flammable and considered dangerous when lit. Liqueurs that are of a lower proof run the risk of not igniting when held to the flame. 2. Cold liquor will not ignite! Heat the brandy or liquor in a saucepan, with high sides, just until bubbles begin to form around the edges (around 130 degrees F. or 54 degrees C.) before adding to the flambepan (you will be able to see vapors rise from the liquid). Do not bring the liquor to a boil, as the liquor will burn off the alcohol, and it will not ignite. The boiling point of alcohol is 175 degrees F. (much lower than water). The liquor can also be heated in a microwave oven by heating 30 to 45 seconds in a microwave-proof dish at 100 percent power. 3. Use a flambepan, large skillet, or large chafing dish with rounded, deep sides and a long handle. 4. If you are planning to flambin front of your guests, light the dish at the table, but far away from guests and flammable objects. If you have a serving cart, now is the time to use it. 5. Never pour liquor from a bottle into a pan that is near an open flame (the flame can follow the stream of alcohol into the bottle and cause it to explode). Always remove the pan with the hot liquor from the heat source before adding the liquor to avoid burning yourself. If the dish doesn’t light, it’s probably not hot enough. 6. Once you add the liquor to the pan, do not delay lighting. You do not want the food to absorb the raw alcohol and retain a harsh flavor. Ignite with a long match (such as fireplace matches or a long barbecue lighter). Always ignite the fumes at the edge of the pan and not the liquid itself. Never lean over the dish or pan as you light the fumes. 7. Let cook until flame disappears (at this point all alcohol has burned off). If you want to retain some of the alcohol flavor, cover flaming dish to extinguish flames or add additional wine or stock. 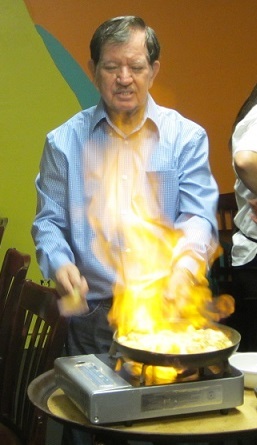 Serve the dish as soon as the flames disappear. It is a good idea to have a large pan lid ready to douse the flames quickly if they seem out of control. If you want the flames, but do not want the liquor in a dessert, soak sugar cubes in a flavored extract. Place the cubes around the perimeter of the dish and light. Also be sure to practice flambing before your guests come as you want to make sure that these steps are performed flawlessly, if you want to impress your guests. Photo taken at Hola Restaurant in Redmond, Oregon. Restaurant features Nouveau Peruvian-Mexican Cuisine. Good info regarding Flambeau process and safety tips. To my knowledge, it not possible to flame without using alcohol.